Custom made American flag decal set replica made from 2004-2008 evinrude 40 hp white engine covers. May work also on 2006, 2007, 2008, 2009. 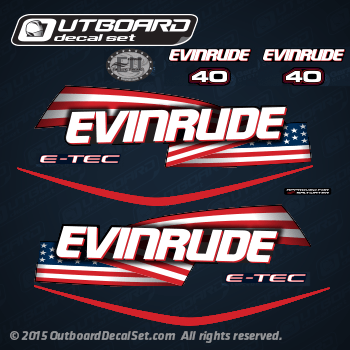 Please ask before to purchase to make sure this Evinrude decal set fit on your cover, if you have another model different thanE40DSLSEC or the model listed will be easy to make a set for you. 2004, 2005, 2006, 2007, 2008 Evinrude 40 hp Stars and Stripes flag decal set for blue engines.